Protecting your company’s intellectual property (IP) could be an issue when sharing the actual 3D models with individuals outside of your organization. I have always felt there’s a fine line between sharing and not letting too much “info” go out the door when trying to satisfy the terms of a business deal. Granted there are 3rd party options out there to help protect your CAD model’s IP, but the cost to own may not be feasible for everybody. As always, I like to investigate if I am able to produce the results I am looking for with the tools that are available to me. For Inventor, one of these tools is called “Shrinkwrap”. Shrinkwrap allows you to simplify your assembly into a single part file. However I am not fully convinced this is the right tool for the job. It’s not always easy to control which information stays on the model and what other items gets removed. Another workflow I have used in the past is to export my assembly to a neutral 3D CAD file (i.e. IGES, STEP, etc) and then import it back into Inventor as a single part file. This works well but someone could still make measurements on my sensitive information and reverse engineer it. 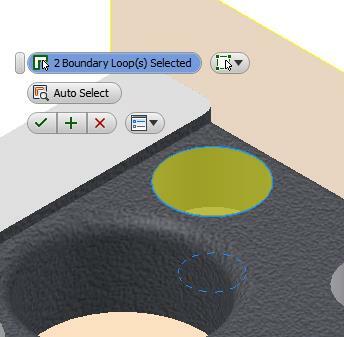 Starting with Inventor 2014, a viable solution is now available to you while in the part and assembly mode. Though it was designed to improve Inventor data being transferred to BIM (Building Information Modeling)/Revit information, I feel this function is useful in protecting your model’s IP. When protecting IP at the part level, your part will automatically be simplified in the beginning so I strongly suggest you first make a copy of your part and then work on the “copied” version. 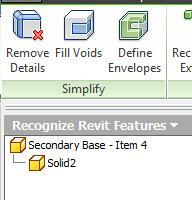 With your part opened, select the BIM ribbon tab and “Recognize Revit Features”. 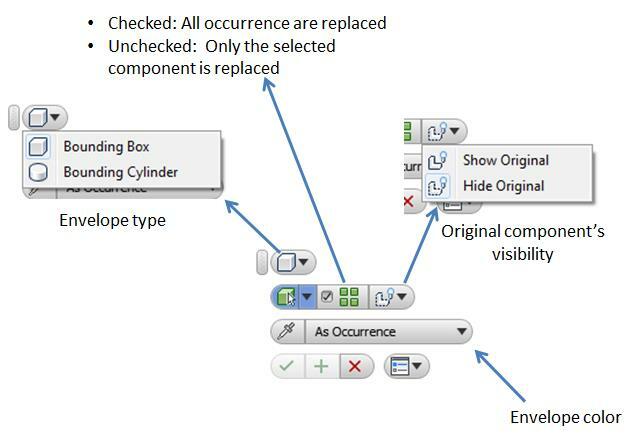 In Inventor 2015, the simplifying tools that will be used in our workflow have been added to the BIM ribbon. 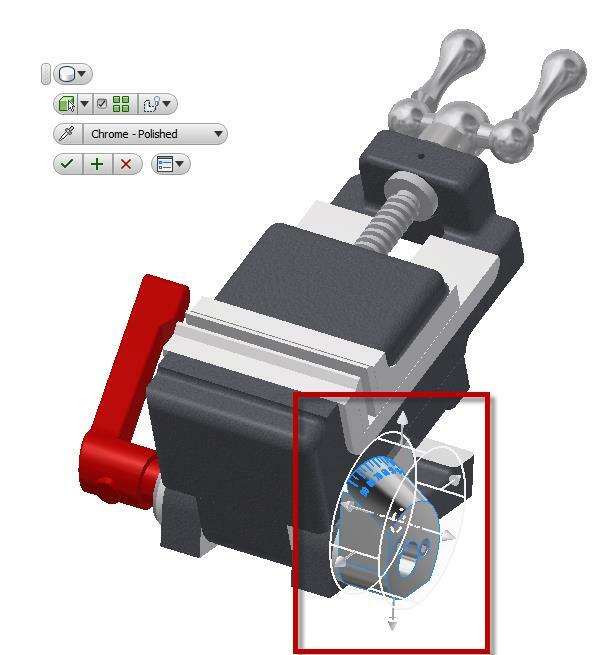 Please continue to follow the article’s workflow whether you are using Inventor 2014 or 2015. When prompted about recognizing Revit features, select the “Keep features recognized by Revit” option and the OKAY button. The “Recognize Revit Features” ribbon now appears showing the related Revit tools and the Inventor browser is switched to represent the part in its simplified state. Next, apply the required “Simplify” tools to simplify your part even further. Use the “Remove Details” tool to remove any chamfer and fillets that you may want to hide in your part. The “Fill Voids” tool will be used to fill in holes, pockets, and etc. 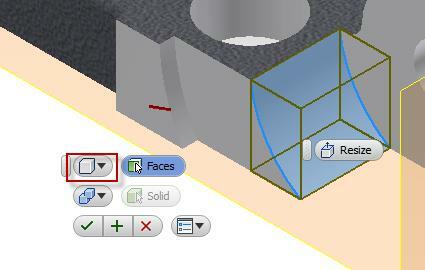 The “Define Envelopes” is applied to convert the selected face into a boundary box or cylinder. 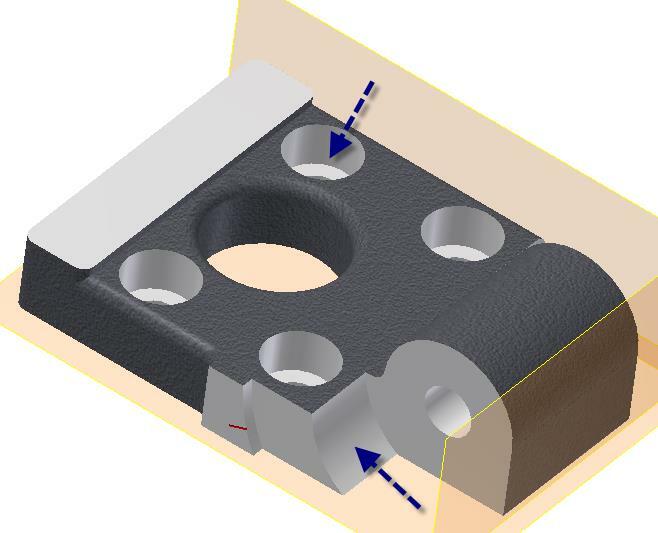 For my example, in my vise mounting plate, I want to protect one of the four mounting holes along with the pivoting surface as indicated in the image below. 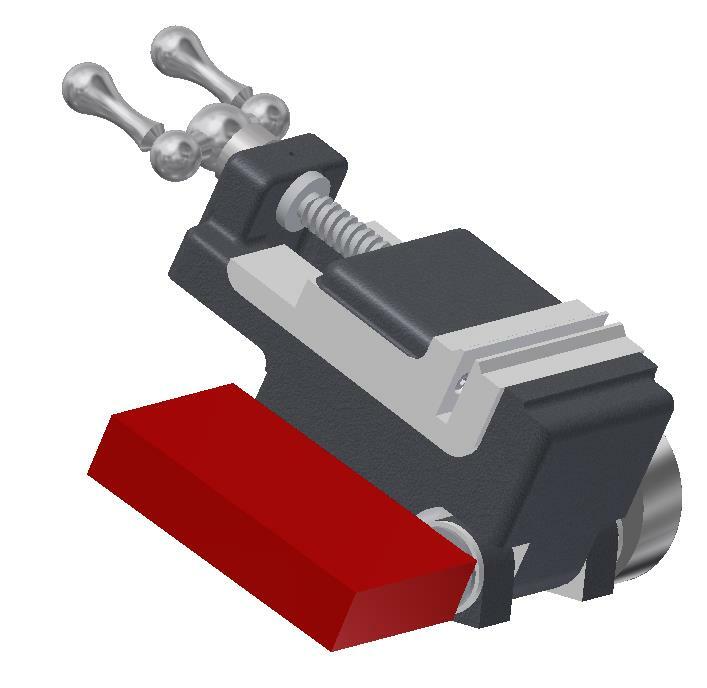 Grinder vise mounting plate design per technical drawing book. 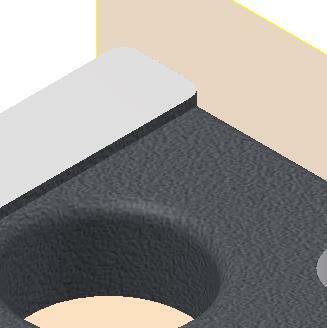 First I will select the “Fill Voids” tool and the two edges that make up the top/bottom of the mounting hole. Next I will apply the fill void feature by selecting the “check mark” button in the heads-up display. For the pivoting surface, I pick the “Define Envelopes” tool, set it to a boundary box in the heads-up display, select my surface and apply the feature. 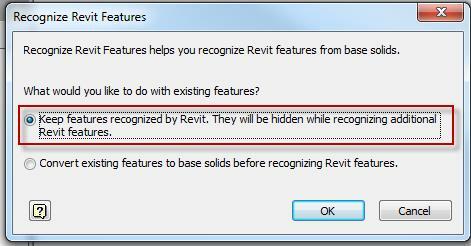 To finish this part, I simply select “Finish Recognize Revit Features” and it’s ready to be saved and sent out. 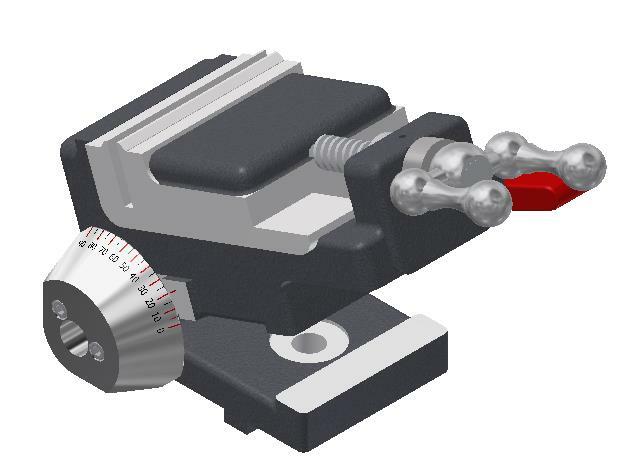 Grinder vise assembly per technical drawing book. 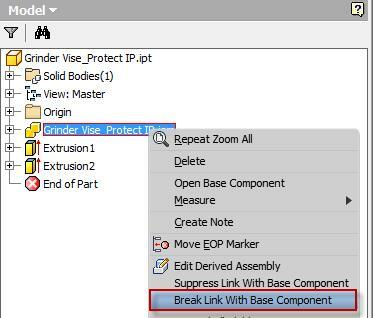 First you will need to protect (“Define Envelopes”) the sensitive components within your model prior to making the assembly a simplified part (“Create Simplified Part”). However I am not a big fan of creating these envelopes inside of my “production” assembly and I suggest creating a copy of your assembly prior to doing this. To protect your sensitive items, toggle over to the “Simplify” ribbon tab and use the “Define Envelopes” tool. 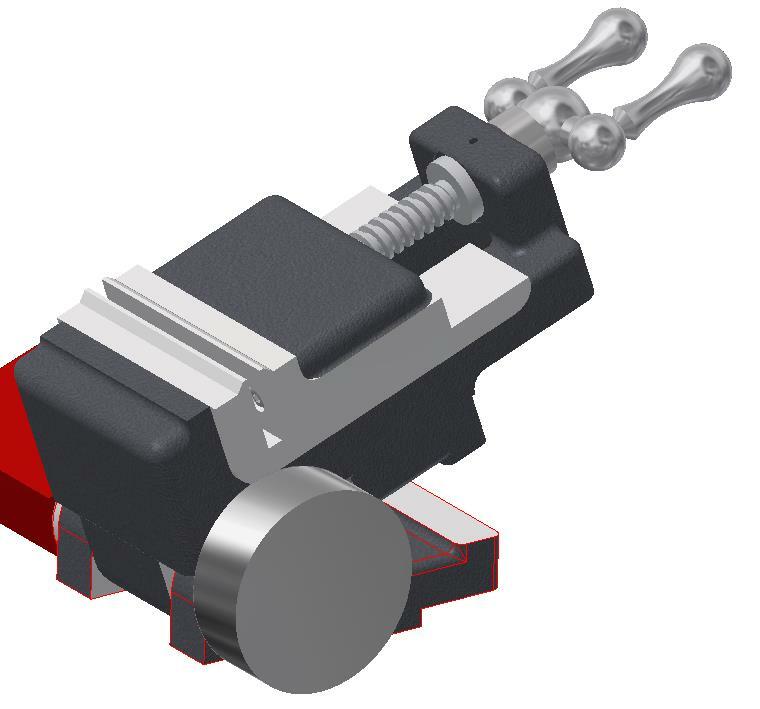 This tool works in the same fashion as it did at the part level, except it will convert the selected part into a boundary box or cylinder. 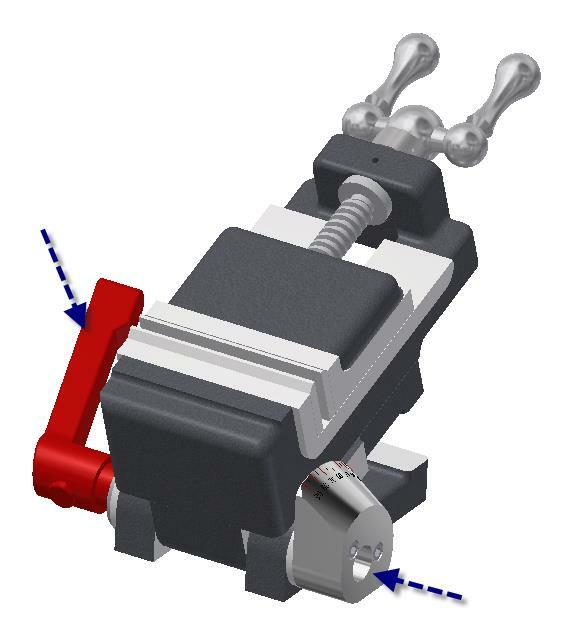 For example, in my assembly, I want to protect the locking handle and pivoting mechanism of the grinder vise. For the pivoting mechanism, I am going to change the envelope type to a bounding cylinder, leaving the color as is and will hide (turn its visibility off) the original component. 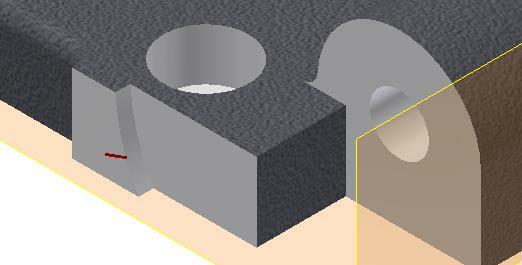 When I select the actual component, a cylindrical envelope outline encompasses my part but I still have ability to adjust its overall size if I need to. For my example I am going to apply the envelope to the rotating mechanism as is and change the type back to a boundary box in order to replace the locking handle of the assembly. 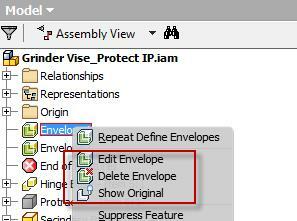 If we now take a peek at the Inventor assembly browser, you will notice there are two envelope definitions being listed in the structure. If you right mouse click on them, you can edit the envelope, delete it, or show/hide the related component. Now that the components are protected, it’s time to simplify the assembly into a single part in order to share with the end user. 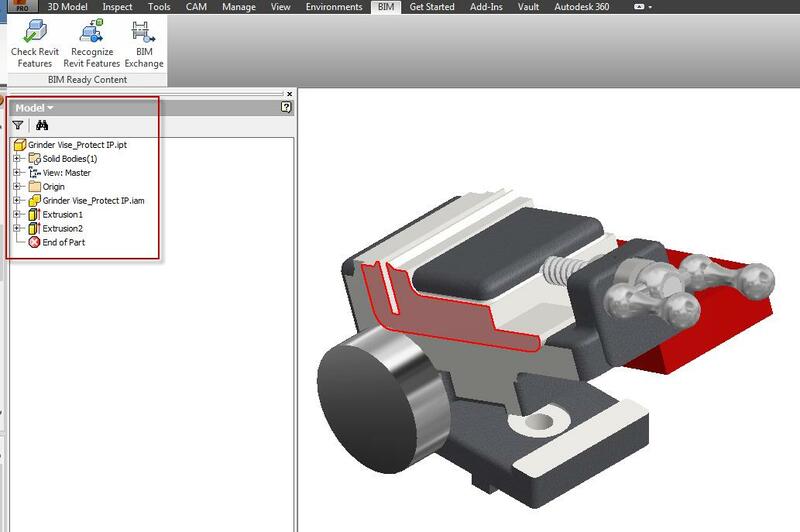 First, select the “Create Simplified Part” function and define the required information per the related dialog. 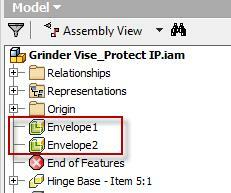 New File Location: In Inventor 2014 there is an issue with this field when a path folder name contains a dot (.). For example a location like this “C:\Users\John.Doe\Documents” would cause an issue. Please avoid using any location path that contains a dot within it. When you select the OK button, Inventor will automatically generate a new window in the Inventor environment showing your assembly as a single part file. However, until you see the derived assembly information within the browser window, the “Create Simplified Part” task has not fully completed by Inventor. At this time we could take the next step and also apply additional protection to our part by using the “Recognize Revit Features” tool and the workflow described earlier. For my example I just need to finish by separating the derived part from its original assembly (“breaking the link to its base component”). I right mouse click on the derived part in the browser and select “Break Link with Base Component”. Now the simplified part is ready to be saved and sent to the end user. Now my protected assembly/part is ready to be saved and sent out. Any questions about this article, feel free to contact us.